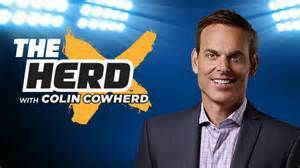 Riding my exercise bike over lunch, I often watch The Herd, featuring Colin Cowherd and his co-host, Kristine Leahy. Both are sharp sports minds and I respect their opinions. And oh they have opinions. What struck me today, and The Herd is supposed to strike a nerve, was Colin's seemingly random comment that the quality of news reporting has degraded as a result, in part, because of bloggers. Hmm, do I degrade the quality of bank reporting because of my blog? His context was the poor reporting done by Al Jazeera America about the theory that Peyton Manning used PEDs. Al Jazeera America was formed in 2013 when the Qatar based Al Jazeera purchased Al Gore's Current TV. Both are/were news organizations, not blogs. So blame the blog for the poor reporting of a news organization? Reporters that dig no deeper on issues than reading celebrity tweets on the air comes back to bloggers? The irony about The Herd being a three-hour opinion show must be lost on him. I do not think blogs degrade news reporting. The Huffington Post, now considered a legitimate news organization, albeit quite left of center, started in 2005 as a blog. Current TV, started as a news organization aimed at a younger audience, was by all measures except one a failure. The exception being the $500 million of Qatar-financed consideration paid to it by Al Jazeera. Funny that their name starts with "Al". But I digress. I don't want to be presumptuous. But I do not think my blog impacts bank industry reporting in the slightest. American Banker isn't worried about Jeff For Banks jumping them for a story. Or any other financial institution blogger for that matter. In fact, I wouldn't be surprised if some news story ideas emanate from industry bloggers. In that regard, industry news organizations may welcome our existence. But to think that SNL Financial gets a news story out quickly and recklessly so a financial industry blog doesn't get there first is nonsense, in my opinion. I can't think of one example where that was true. Blogs have different reasons for existing. Some hone writing skills, or simply are hobbies. I do it to increase my knowledge of micro issues, engage with people I wouldn't otherwise know, and hopefully spur discussions among financial institution executives on the future of their institution and our industry. I don't own a fedora, monitor newswires, or watch CNBC, fingers at the ready for my next blog post. I struggle to post three per month. So Colin, with regard to your theory that bloggers decrease the quality of reporting, your Herd is thin. Is That a Risky Bank Customer?